One place I’ve been meaning to mention is this pub on Gillygate, now Monroes, formerly (as pictured) the Pink Pony, formerly … loads of other names (see below). Towards the end of last year permission was given for conversion to a hostel with a bar and restaurant below. There’s a follow-up application in currently for a new door to the front of the building. The building has clearly been floundering as a pub over the last few years, apparently unsure what to do with itself. 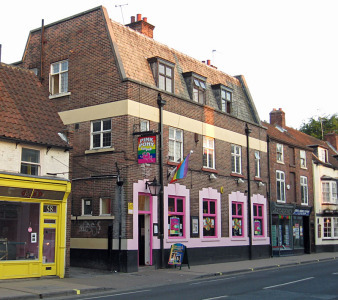 Personally I have quite a fondness for the place, as it’s the first pub I remember frequenting regularly, back in 1984. Yes, thirty years ago. For a few months in 1984 I was in there most nights, meeting friends. Then shortly after that it changed its name and look and became ‘Gillys’, all trendy, with chrome bits, as I recall. In the intervening twenty years or so I stopped paying attention and so there’s a gap in my knowledge of it which perhaps someone else can fill via the comments below. Then, for some years, more recently, it was a music venue. I remember seeing a few bands there. It changed its name many times in the last decade. It was Cert 18 in 2004, as this photo I took in August that year reminds me. Then I think called Stereo. Then the Pink Pony, more recently Monroes. Perhaps other names too. Speakeasy, apparently? As a music venue it seemed very popular and busy. Since then, when I’ve passed in the evening and had a look in, it’s seemed really quiet, and is often apparently closed. It’s had one of those ‘Would you like to run this pub?’ banners on the front of it recently, which isn’t a good sign. It’s a large building, with two floors above. What was all that space used for? Was it more of a hotel, when built? I never gave the space above the pub a thought. ‘Who the accommodation would be aimed at’, the now infamous stag and hen parties, according to many of those who objected or left comments on the Press story about the plans. (Though a document from the owners Punch Taverns, available online (see PDF, below) suggests intended customers are the ‘youth, student and backpacking community’.) If stag and hen parties use it, I guess it could be said that a steady stream of people going to and from the hostel, here for the weekend with plenty of disposable income to spend, might be welcomed by the shops in the street? Just along from it the Gillygate has recently undergone a major makeover. The poor old Bay Horse/Cert18/Stereo/Speakeasy/Pink Pony/Monroes apparently couldn’t continue as a pub however many makeovers it had, hence its new future as budget accommodation. Or, perhaps, Las Vegas in Gillygate. 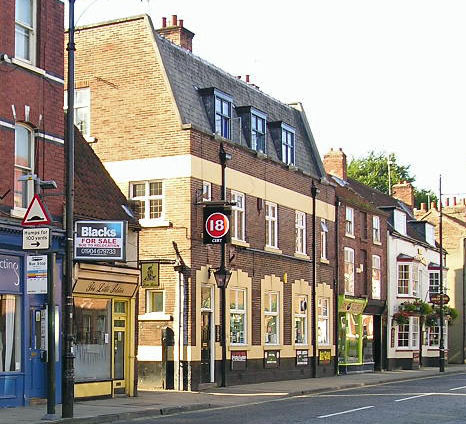 The application details are: 15/00029/FUL | Replacement shopfront including erection of secondary door to front and full height window and replacement entrance door | Monroes 54 Gillygate York YO31 7EQ. This is the link, or if that doesn’t work you can search on this link using the reference number or address. I’ve also found some information (PDF) from Punch Taverns on the plans for the building, though not sure how up to date this document is. An earlier page on York Stories includes a photo of the earlier building on this site, taken from a window across the street, circa 1930. I remember the Bay Horse as the first place I managed to get served in when I was a dopey 15 or 16 year old in 84/85. It had a brilliant atmosphere, full of bikers and young wanna be bikers like me with my leather & cut off denim. I remember the instruction if the police decided to raid, was to quickly pour your drink on the floor. Love the website, I only discovered it in the last couple of days, I’d love to see some articles on Holgate and South Bank in the future. I hope those are of interest. If you (or any other readers) would like to become a supporting subscriber, you can do that via the Support this site page, and your support would be very much appreciated.